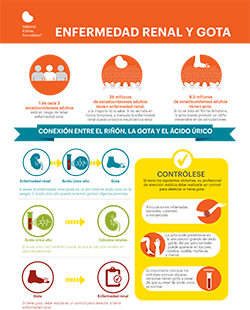 This video, geared towards patients, includes a conversation between a healthcare professional and a patient that highlights key guidance for people with both chronic kidney disease and gout. Hear from a patient as he looks back on a life with gout and how he has dealt with it medically, physically, and emotionally. 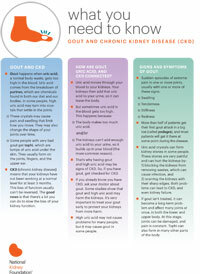 An easy-to-understand fact sheet informing patients about gout and CKD, and why and how they should manage both conditions. 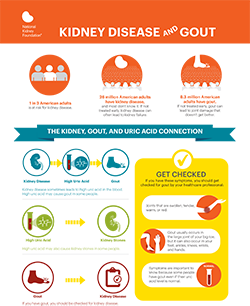 Track your serum uric acid (sUA) level (amount of uric acid in your blood), estimated glomerular filtration rate (eGFR) and albumin-to-creatinine ratio using the online Gout and Uric Acid Tracker by clicking here (Excel download), or by printing out the PDF version. 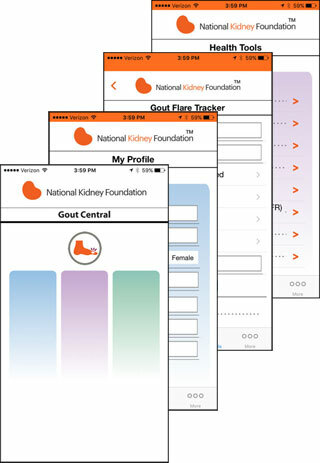 "Gout Central" our newly updated mobile app for patients empowers the user with the most essential tools and information for controlling gout and protecting their kidneys. Guidance is provided on optimal use of nutrition, lifestyle, and medication for the prevention and treatment of gout flares.